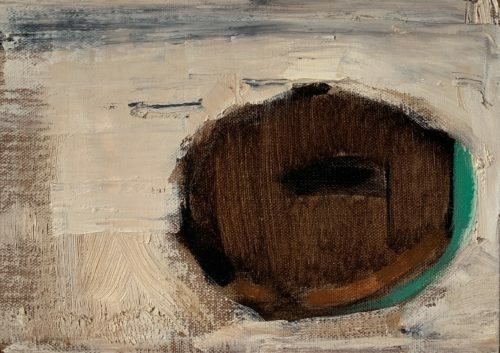 This entry was posted in Still Life Paintings and tagged 5 x 7 inches, donut, doughnut, kevin inman, oil on linen on panel on February 1, 2019 by Kevin. 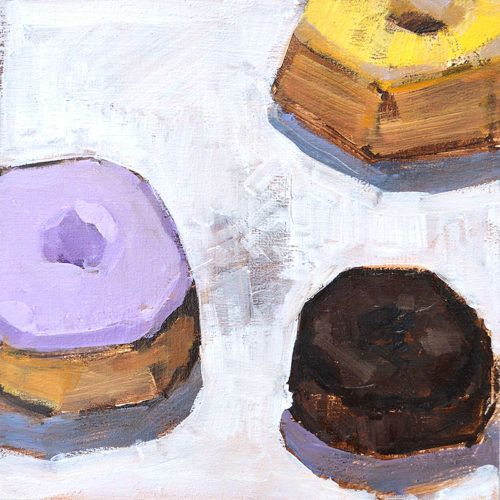 This entry was posted in Still Life Paintings and tagged 8 x 13 inches, donut, ghost croissant, kevin inman, oil on panel, still life on December 9, 2016 by Kevin. I thought these frosting colors were especially luscious. 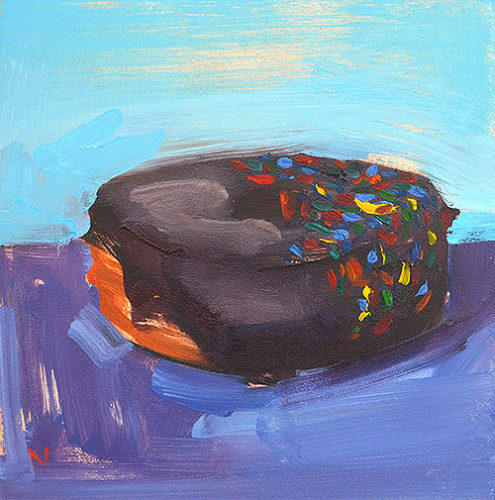 This entry was posted in Still Life Paintings and tagged 8 x 8 inches, donut, kevin inman, oil on panel, san diego, still life on December 8, 2016 by Kevin. A dozen to choose from. 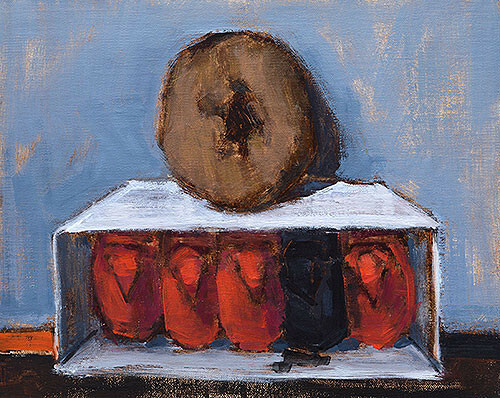 This entry was posted in Still Life Paintings and tagged 4 x 4 inches, breakfast, donut, donuts, kevin inman, oil on panel, still life on October 28, 2016 by Kevin. 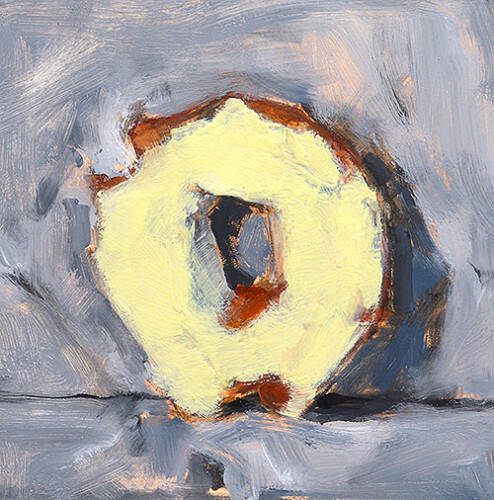 This entry was posted in Still Life Paintings and tagged 6 x 6 inches, donut, doughnut, kevin inman, oil on panel, still life painting on September 21, 2016 by Kevin. Something’s going on with those sprinkles. 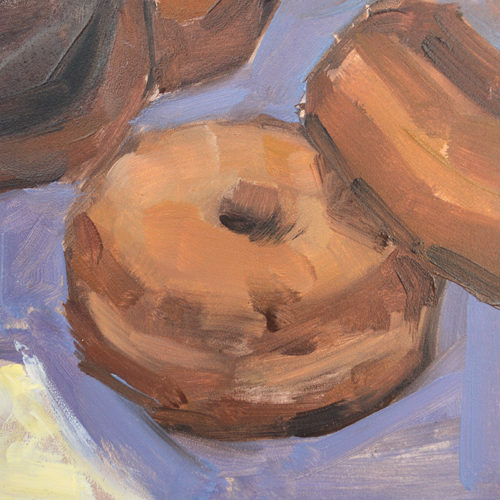 This entry was posted in Still Life Paintings and tagged 6 x 6 inches, breakfast, chocolate, donut, doughnut, kevin inman, oil on panel, san diego, still life painting on August 8, 2016 by Kevin. My neighbor’s 5 year old threw the doll leg over the fence, presumably to torture his sister. I felt minimal guilt about keeping it, along with the head and dismembered torso. 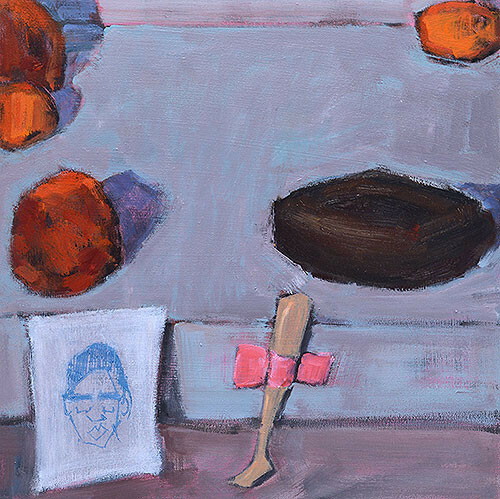 This entry was posted in Still Life Paintings and tagged 10 x 10 inches, citrus, doll leg, donut, oil on panel, still life on April 26, 2016 by Kevin. 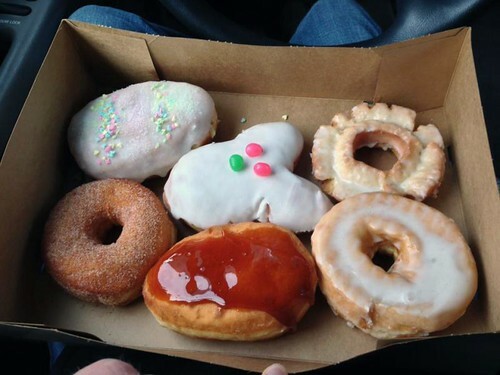 Lately I’ve been stopping after the gym to buy donuts and I’ve noticed they truly have a diverse array. Whoever bakes these is an artist of flavor and texture- at a normal, albeit somewhat bougie, supermarket. 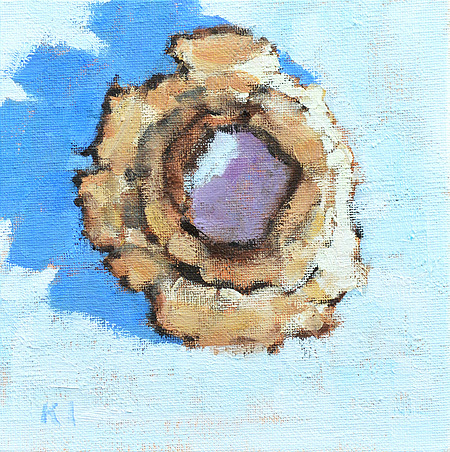 This entry was posted in Still Life Paintings and tagged 6 x 6 inches, donut, doughnut, oil on panel, still life painting on April 19, 2016 by Kevin. I bought this donut to paint. 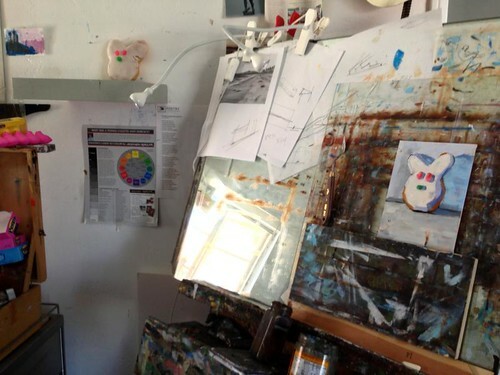 Then, it was late and I took it from the kitchen to the studio. I took a nibble. Then another nibble. This is all that was left. 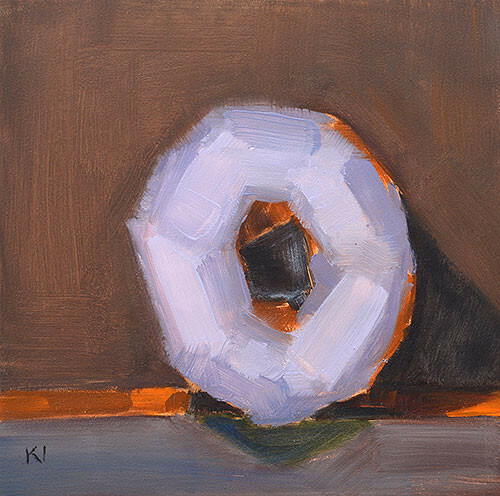 This entry was posted in Still Life Paintings and tagged 6 x 6 inches, donut, doughnut, oil on panel, still life on April 6, 2016 by Kevin. It was a cinnamon donut and fruit punch Peeps- a new color and they actually smelled pretty good. But Peeps are always a metaphor for something. 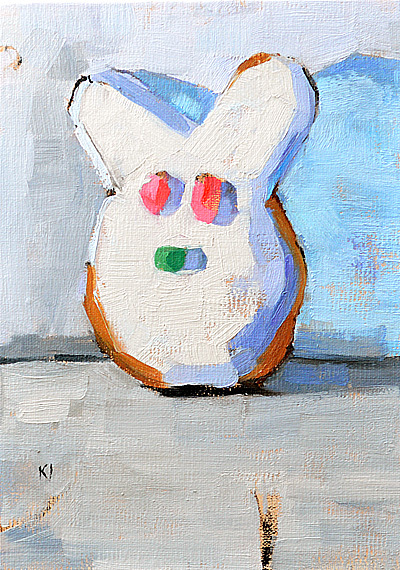 This entry was posted in Still Life Paintings and tagged 8 x 10 inches, donut, easter, oil on linen, peeps, still life on March 30, 2016 by Kevin. Woke up Christmas Eve morning to find Mike had waited in line an hour and a half at Donut Bar to bring me Christmas donuts to paint. Their donuts are great, their efficiency and the ergonomic catastrophe of their store less so. A really special treat. 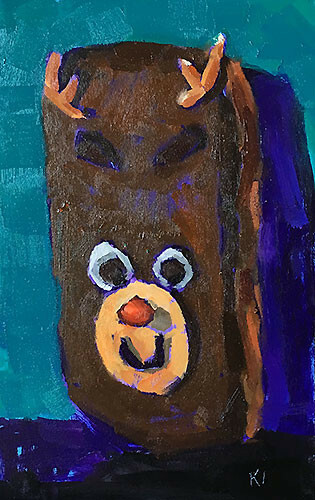 This entry was posted in Still Life Paintings and tagged 5 x 8 inches, christmas, donut, oil on panel, rudolph, san diego on December 24, 2015 by Kevin. So I bought this donut before going to Vegas and didn’t have time to paint it. After two weeks in the fridge, it still looked like a donut and smelled like a donut, albeit with less-pretty frosting. An old-fashioned donut deserves an old-fashioned treatment, doesn’t it? This one comes from the Spanish Baroque. 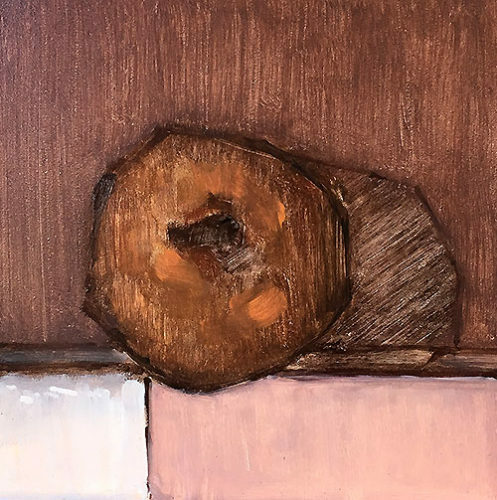 This entry was posted in Still Life Paintings and tagged 6 x 6 inches, donut, doughnut, oil on panel, still life on October 1, 2015 by Kevin. Old fashioned glazed donut from Donut Bar in San Diego… delicious. 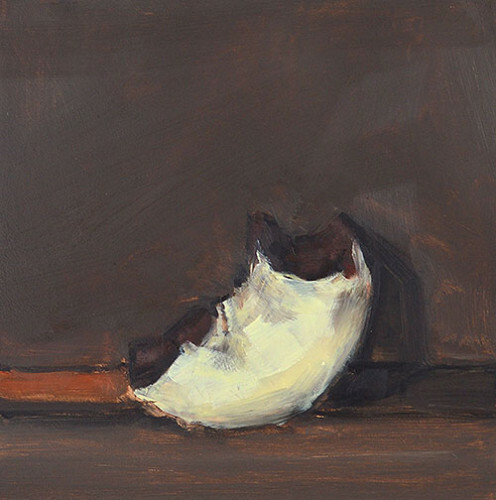 This entry was posted in Still Life Paintings and tagged 6 x 6 inches, donut, donut bar, doughnut, oil on canvas board, san diego, still life on April 10, 2013 by Kevin. Glazed donut in the shape of the Easter Bunny, with Jelly Bean eyes. This is from a place in San Diego called Donut Bar, where you wait in line for an anxious eternity to get what are apparently THE BEST DONUTS IN THE WORLD. Only painted this one though. The rest are slated for demolition tomorrow. 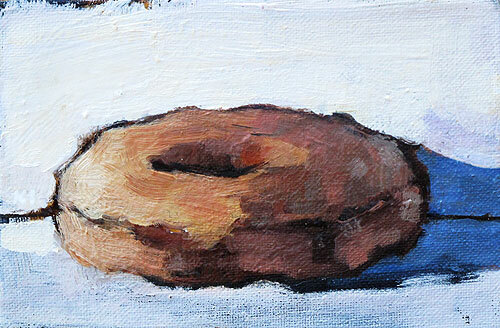 This entry was posted in Still Life Paintings and tagged 5 x 7 inches, donut, donut painting, doughnut, easter, easter bunny, oil on linen on panel, san diego on March 30, 2013 by Kevin. Glazed donut from 7-11. I went through a phase of being fascinated by the complex topographies of the seemingly simple shapes of donuts. 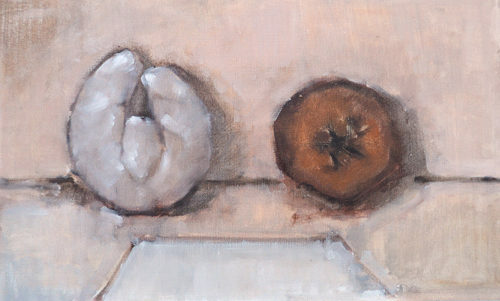 This entry was posted in San Diego Paintings, Still Life Paintings and tagged 4 x 6 inches, breakfast, dessert, donut, doughnut, oil on canvas board, painting, still life on January 6, 2013 by Kevin.